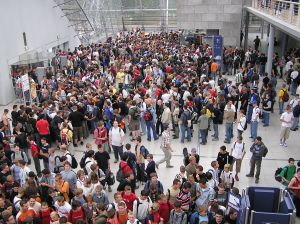 Two weeks ago, thousands stood in line to be among the first to get their hands on the PlayStation 3. Surprisingly, many of these people who waited through the cold, rain, and snow did not actually want to keep the PS3. They wanted to buy it for $600 and sell it on eBay for twice the price--a profit-seeking behavior known as arbitrage. Economists define arbitrage as the act of profiting without bearing any risk. A large shortage is the best indicator of an arbitrage opportunity. A shortage occurs when quantity demanded exceeds quantity supplied--in other words, when the number of PS3's that consumers are willing and able to buy at the current retail price exceeds the number of PS3's available in stores. A shortage implies that there are consumers willing to pay more than $600 for a PS3 who were unable to purchase one because they were too busy to stand in line or too far back in the line. Arbitrage is a means to allocate the PS3's from the initial buyers to the people who want them even more than the original buyers. 1. Sony should have forecasted the shortages and price bids on eBay for the PS3 because they sold out of other popular consoles when they were first released (PlayStation, PS2, and PSP). Would it be profitable for Sony to eliminate the "frenzy shortages" by pricing high during the first months and lowering prices afterwards? For example, they could charge $1,000 for the PS3 in November and December, but lower it to $600 afterwards. 2. Sony reports that it costs more than $600 to produce a PS3. Why would it be profitable for Sony to sell the PS3 at an initial loss? 3. Why would a gamer prefer to pay $1,200 for a PS3 on eBay rather than standing in line to buy one for $600? The definition of "profiting without bearing any risk" is not applicable here if you don't ignore the very real risks of standing in line for one of these units. First, standing in line, often for days and in the cold, has the very real cost of lost income or lost opportunity to use your time elsewhere. Risks while in line may include anything from arguments and fights in the line to being told to go home before the sale to catching a cold. However, the major risk is that when you go to buy the unit it will not be there - numbers available at each store was unconfirmed, thus many standing in line received NOTHING. Like many things in economics, the definition and theory fits only if you ignore a huge number of facts, issues, and variables (all conveniently called "externalities"). If only science were so bold - ignore that which doesn't fit your model. As for the questions, anyone even moderately following the PS3 launch would know the answers. First, Sony would have an even worse PR nightmare if it raised prices, and only a fool would think that launch demand would significantly decrease without major price hikes. In fact, it is hard to tell whether a higher initial launch price would just create even greater scalping prices. As is widely reported, Sony makes the PS3 at a loss because over time it hopes to make money on associated products such as games (and associated deals) and it hopes that over the run of production the cost of production will come down. you deserve to be kicked out of econ class and forced to live in the real world for a few minutes instead of asking silly, uninteresting quetions. Are There Too Many Wal-Mart Jobs, or Too Few? A College Degree to Teach the ABC's?